The Camel family isn't very popular with copywriters. We've less than twenty adverts and only two of them with llamas. It's remarkable that all (but one) finds are dated after the year 2000. 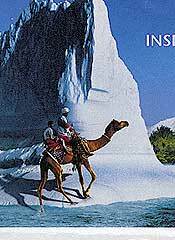 Camels - that is generally known - cruise the deserts on a drop of water. They are therefore almost exclusively cast in a dry setting and relating to frugality while a chuckle is never far away. In Belgium we have plenty of water, almost no oil and we're driving with cars. 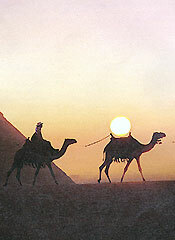 In the Middle East they have plenty of oil, almost no water and trafic is camel-based. 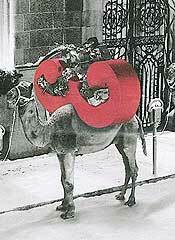 Wouldn't it be nice to have your car as frugal as a camel? It can be done with Black Gold® The text then explains how the stuff works and ends with Black Gold® let's you save much black gold. That's at least suggestions a, b and f of the USCA-advice. We have an advert of the same brand where it stresses the power of the engine and not it's mileage. That's a job beyond the camel's capacities and a black panther was chosen (see Bigger cats, ad 8). The closing line there was Black Gold®. Black power . 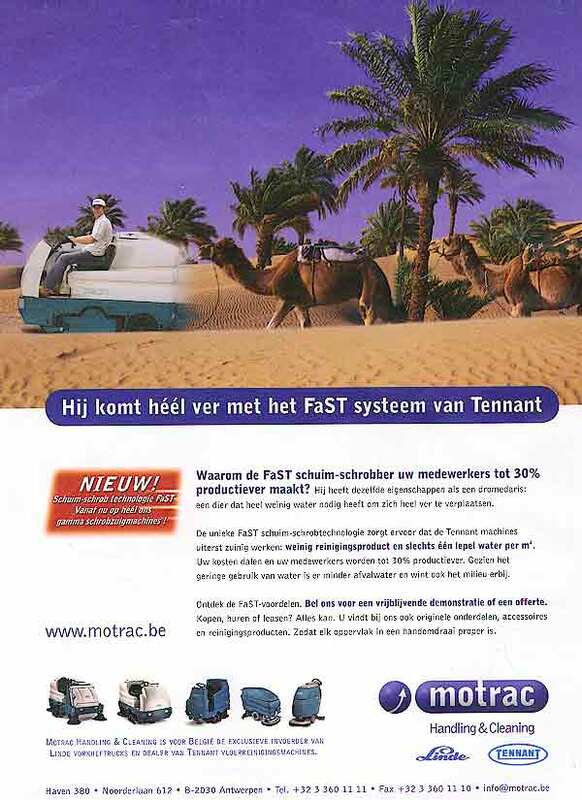 (2) 2005 - Floor scrubber needing less water than a camel. The floor scrubber (2) has the same characteristics as the dromedary: an animal needing almost no water to walk very far . The scrubber needs just one spoon per square meter which makes for less waste and is good for the environment, they say. The approach of the J & B whisky brand is most original (3). 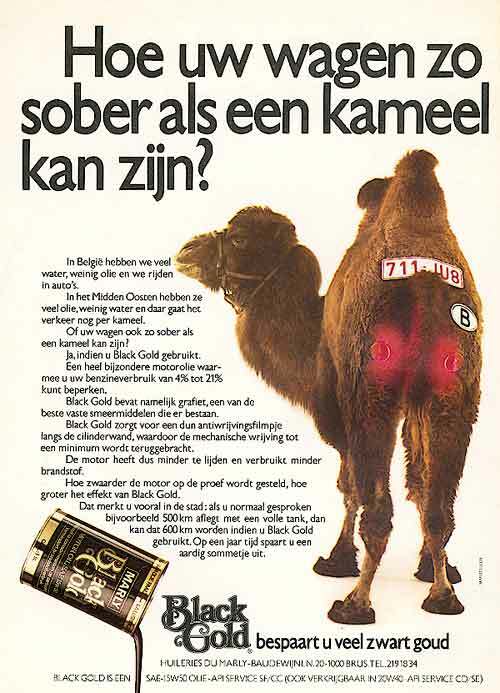 I consider it (one of) the best camel advertisement(s). It was published in December in full christmass frenzy. The brand's name is not mentioned but the El único que es único (a play with words in Spanish meaning the only one which is unique) makes clear that it's about Justerini & Brooks whisky. The ampersand (& that is) has a weird shape more like a capital E than a real ampersand. Turn it 90° counter clock wise and you have two nice baskets ready for a load of presents. 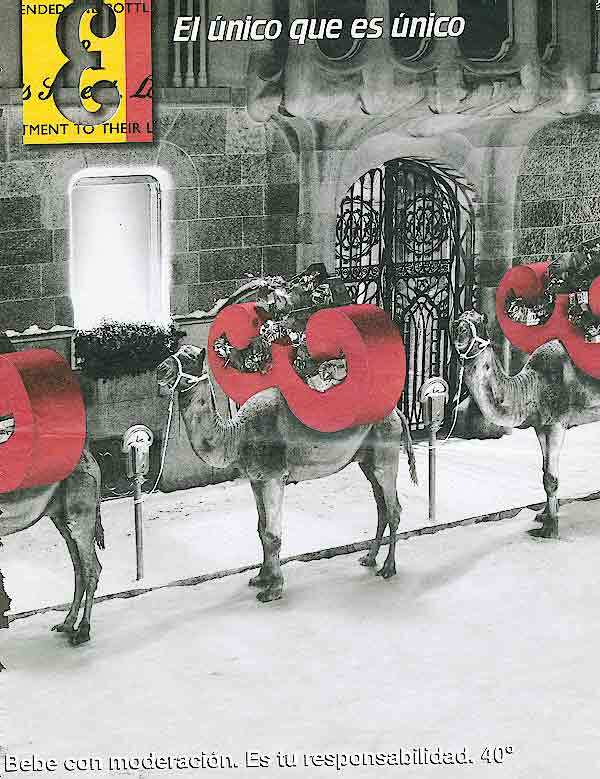 A horse, or a donkey, or a raindeer (it depends on who's bringing the presents) could have been chosen, but the designer took a camel. A very good choice in view of the footer Drink responsibly . 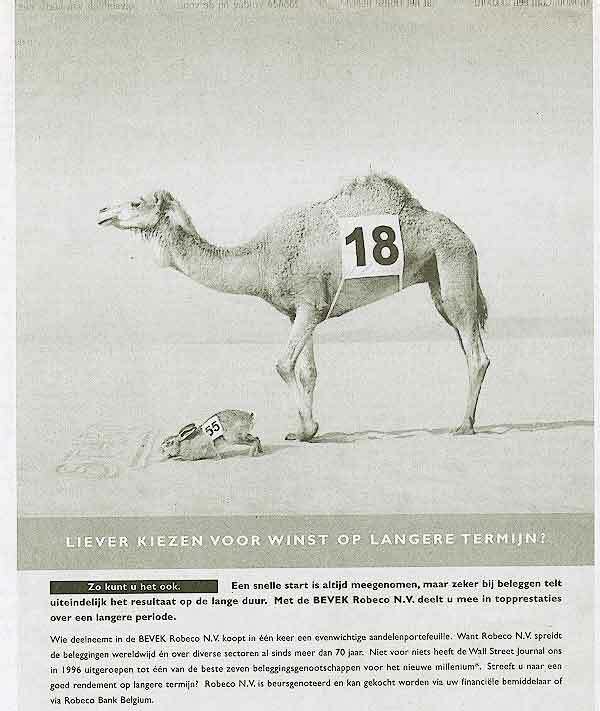 The message is enhanced by queueing the camels next to a row of parking meters: this is about driving and drinking. Well done. 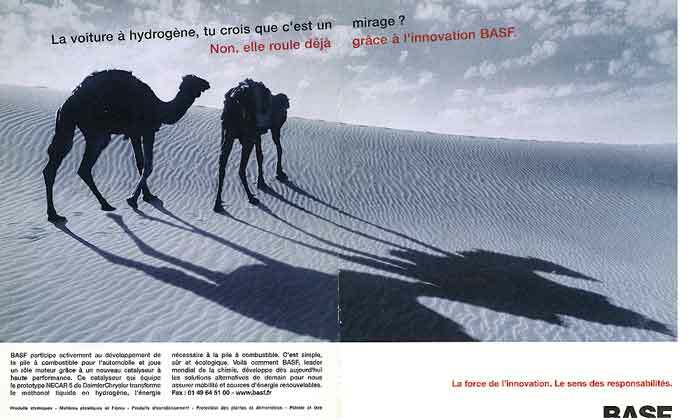 (4) 2002 - You think it's a mirage? - Hydrogen engine (5) 2005 - Our consultants bring you that little extra. 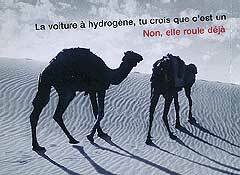 Do you believe that a hydrogen car is a mirage? It's actually on the road already. (As a prototype of course.) Advert 4 says that's a simple solution, reliable and ecological! 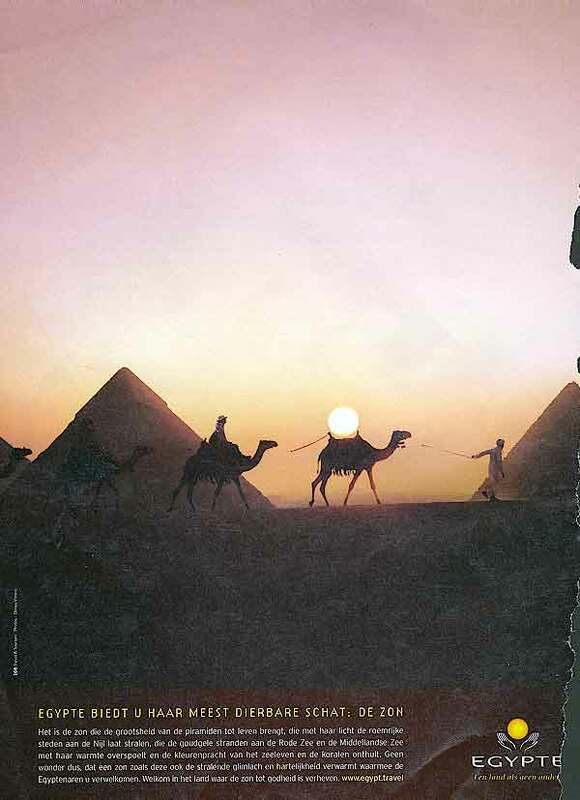 The camels probably have a double meaning. First they stand for the desert where mirages are often seen, I think. A second reason could be that they run a long time on small amounts of food and drink and because the end product of the combustion is water. Our consultants bring you that little extra (ad 5). They recognize an opportunity when they see one. To the benefit of your project. Making the impossible (or dreams) happen is often illustrated with contrast. 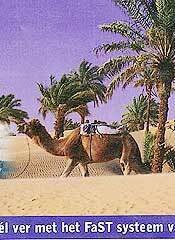 With camels the approach of choice is contrasting this hot desert animal with something cold. 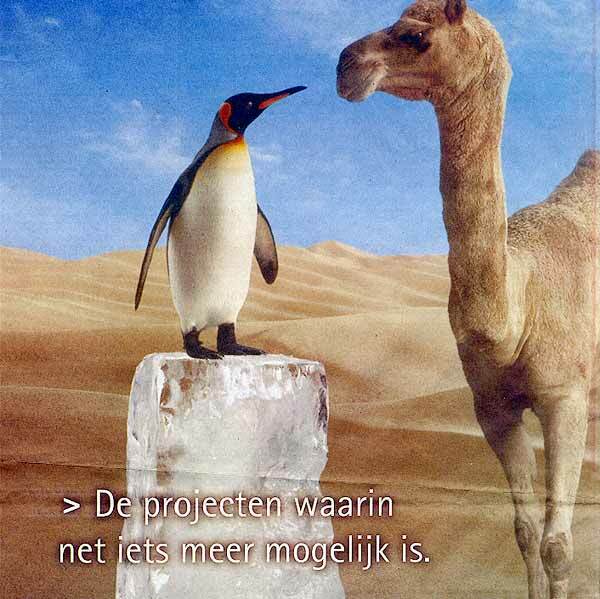 We learn from the penguin of ad 5 that this company goes far out of the way to make the impossible happen (We have more penguins in the desert). 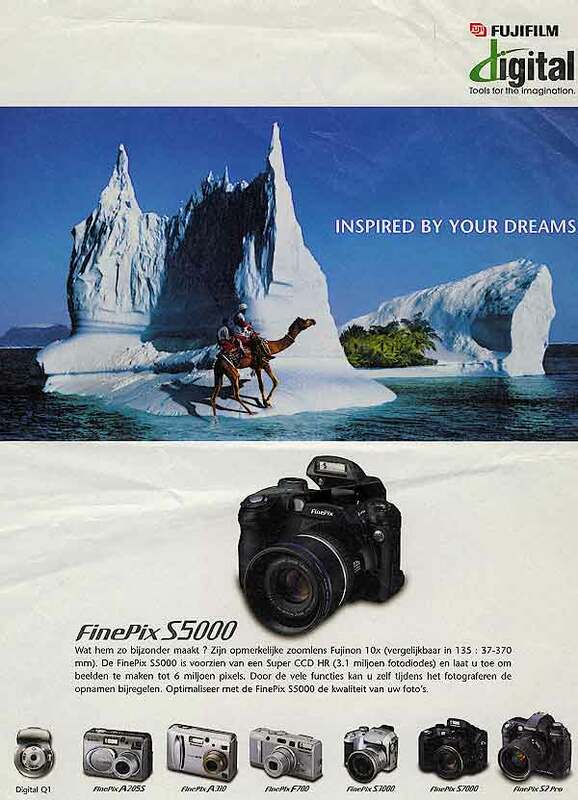 In example 7 it's the camel who's leaving his habitat and emerges on an ice-berg to illustrate that with this camera you're only limited by your own imagination. The Turtle and the Hair becomes The Camel and the Hair in advert 8. Speed and continous effort were important points in the original story. 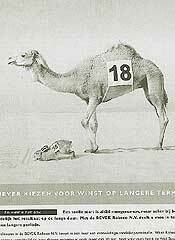 The investment company agrees that a fast start (the hair) is welcomed but that long term results (the infatiguable camel) are more important. But why was the turtle not good enough and had to be replaced by a camel? 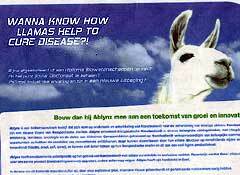 Lamas are related with camels and were found in two advertisements. 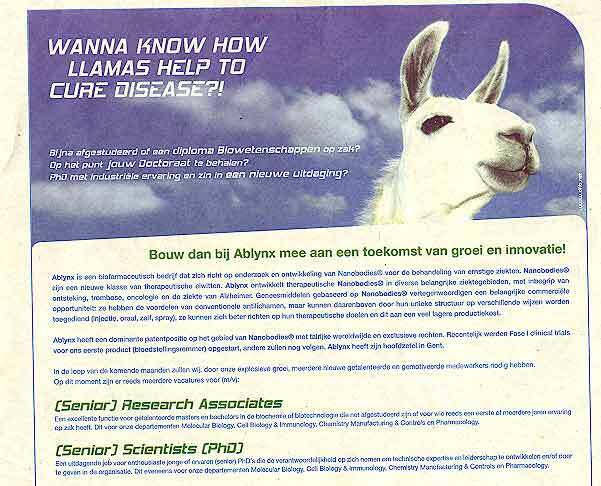 In the first advert the Lama stands for adventure and Peru (a bit like ad 6 where the camel relates to Egypt). 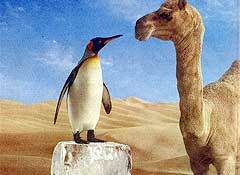 Wild camels are critically endangered. The Wild Camel Protection Foundation tries to save them. 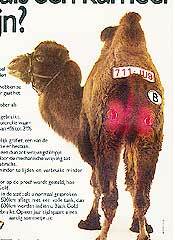 Read at Wild Camel Protection Foundation how you can help to protect the wild Bactrian camel.